Some of the Leica cameras: Leica M4 with 21 mm Super-Anuglon-M f/3.4 and 50mm Summicron-M f/2.0 behind it. A Minolta Flashmeter IV (used for measuring light manually). Leica R8 with motor drive and 35-70mm Vario-Elmar-R f/4.0 and the Leicaflex SLmot with 80mm Summilux-R f/1.4 (and the 35mm Elmarit-R f/2.8 and 90mm Summicron-R f/2.0 behind them). Finally the Leica Minilux with buit in silent winder and 40mm Summicron f/2.8 autofocus lens. Courtesy of Justin Scott, Australia. 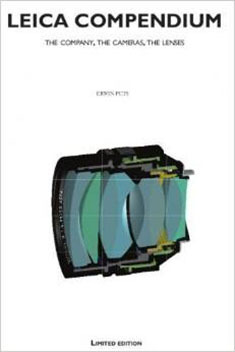 If you are looking for the Leica Compendium by Erwin Puts, please wisit his website for more info, or try search eBay for his books (usually sold out from the publisher rather fast, so they become collectors items). Design exterior as Leica M3, interior as Leica M6. Anniversary edition to celebrate the 80th Anniversary of Leica, the 40th anniversary of Leica M and the 10th anniversary of Leica M.
New silent shutter / Sapphire glass on display / Bright line frames changed to 2 meter accuracy instead of 0,7 meter). ("S"napshot mode, auto-ISO and SDHC-support are in a free firmware release). black paint red dot. Comes with a full Lightroom licence. Set with 35mm Summilux-M ASPH f/1.4 titanium lens, limited edition book, leather straps and lens shade. Design by Walter de'Silva. (Price for the set in Nov. 2010: 22,000 Euro, all delivered Dec 2010]. Comes with a full Lightroom licence. Hammertone in MP-style (no red dot). As Leica M9-P below. With 28mm Elmarit-M ASPH f/2.8 set lens and hammertone lens shade. Sold out in few days. Comes with a full Lightroom licence. Released June 21, 2011 in Paris. Silver or black in MP-style (no red dot). As Leica M9 but with sapphire glass on display and classic Leica engraving on top plate. Comes with a full Lightroom licence. New top plate without red dot but with classic Leica engraving on top plate / New bottom plate / Sapphire glass on display. Celebrating the Leica Store Ginza Tokyo anniverary in March 2012 100 limited edition white Leica M9-P were made, with a Leica 50mm Noctilux-M ASPH f/.095 silver. Leica M9-P Hermes Limited Edition Jean-Louis Dumas with three lenses; 50mm Noctilux, 50mm Summilux and 28mm Summicron. Also with a limited edition Hermes Camera Bag. This is a redesign of the lens barrel texture, in anodized silver and with Hermes orange numbers. Body re-design in silver chrome finish with Veau Swift burnt tan calfskin leather. Another 300 sets Leica M9-P Hermes Limited Edition with the Leica 50mm Summilux-M ASPH Hermes Limited Edition was released as well, price € 20,000 / 25,000$. Leica M9-P Hermes Limited Edition with 50mm Summilux. Price € 20,000 / 25,000$. Leica M9-P based body with new black and white (monochrom) sensor. Base ISO 320 with ISO settings from (pull 160) to 10,000 ISO. Shoots DNG but with possibility of shooting JPG at the same time (can be set to Normal b&w JPG, sepia, cold or selenium toning. In many ways like the Leica M9-p but without the snapshot mode. Delivered with free Adobe Lightroom 4 and Silver Efex Pro 2 software. Released 2014 as limited run with the red dot logo on front of the camera. Price approx 10% more than the black Leica M Monochrom without logo (the one that ws released in 2012). A few silver versions had been custom made previously as a la carte versions for customers. Announced at Photokina in September 2012 as the new entry level camera, delivery started the day after. 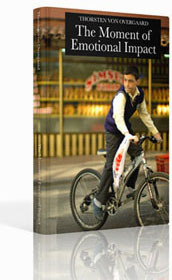 Delivered with free Adobe Lightroom 4. Limited edition along with a Leica M-A film camera and three Summilux lenses 28mm, 35mm, 50mm), all in stainless steel. Announced at the opening of the new Leica Campus in Wetzlar in May, 2014. The Leica M 240 without red dot logo, and with 2GB buffer. Delivery started in August, 2014. This is a Leica M9 body with a Leica M 240 inside and the Leica M 240 screen, controls and thumb wheel on the back. It further has a 1GB buffer (a mix of the M-P 240's 2 GB and the M9's 0GB). A interim model between the Leica M9 and the Leica M 241. Delivery started in December 2015. Incl. 90 days Adobe Cloud trial. The same as Leica M 262 that was released in December 2015, but this time without a screen on the back. Inspired by the success of the Leica M60 that was the first digital rangefinder without a screen. Delivery started June 2016. Leica M-P 240 Safari Limited Edition Digital rangefinder. Set with silver 35mm Summicron-M ASPH f/2.0 and silver ventilated lens shade and leather strap. The Leica M 240 can be upgraded to the Leica M-P 240 as far goes the screen and the look, but not as far as the 2GB buffer and frame selector goes. Announced at Photokina in September 2014. Basic filmlike version of the Leica M 240 digital rangefinder without screen and video. Celebrates the 60th year anniversary from the introduction of the Leica M3 in 1954. Leica M Typ 246 "Elliott"
Based on the Leica M 240 body with CMOS monochrom sensor with no AA filter. Delivered with free Adobe Lightroom 6 (Lightroom CC) and Silver Efex Pro 2 software. 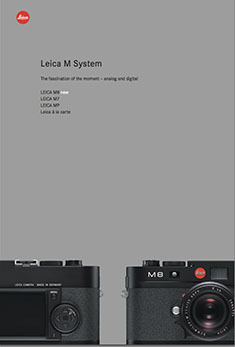 Leica S2 digital medium-format digital camera for Leica S lenses and (via adapter) R lenses, Hasselblad lenses and more. Equipped with both focal plane shutter (FPS) central shutter (CS) in one camera. Comes with a full Lightroom licence. digital medium-format digital camera for The updated Leica S, now without the S2 or S3 but simply S.
Takes L eica S lenses and (via adapter) R lenses. Equipped with both focal plane shutter (FPS) central shutter (CS) in one camera. Comes with a full Lightroom licence. The Leica S from 2012 re-launched in updated design at Photokina 2014 as the lower price entry-model model (with a large firmware update just prior to speed up the camera). Comes with a full Lightroom licence. CMOS sensor and the Leica Maestro II image processor,	2	GB	buffer	and	video. With built-in GPS and WiFi (WLAN). Extras: Leica S-Adapter H for Hasselblad H lenses and the Leica S-Adapter C for Contax 645, Leica R to S adapter. 10002 Leicaflex (I) silver chrome (battery on all time; has a 'pie-shaped' counter on top. 10002 Leicaflex (II) silver chrome (battery on only when rewind arm is outv; has a round counter on top. 14 439 Leica Digital Module R (DMR) (2006) is a digital back for Leica R8 & Leica R9. In a matter of minutes yiu can change the film back into a digital back. Leica R10 dSLR for AF-R lenses and R lenses was planned and announced in 2008. But in July of 2009 Leica Camera AG announced that they wouldn't proceed with the development as their research had shown it wouldn't be feasible - or that if they build it, it would be so expensive few would want to buy one. At the same time Leica Camera AG promised "some solution" for Leica R glasses in the future, which at Photokina 2012 became the Leica M that takes Leica R lenses and can be fitted with a electronic vievfinder to help focus the R lenses. Digital Leica mirrorless cameras that takes Leica TL lenses as well as many other Leica lenses via bayonet adapter. Full-frame mirrorless auto-focus system introduced in September 2015 with a new range of lenses, as well as capability to take any Leica lens ever made. Leica M to SL adapter (2015) is essentially the same adapter as the one used for the Leica T.
Leica screwmount to M to SL adapter (2015) Usually you would buy a Leica or 3rd party screw mount adapter and often leave it on the screw mount Leica lens. Then it fits into the Leica M mount. Leica R to SL adapter (2016). Leica Cine Lens to SL adapter (2015). New APS-C format CMOS camea system with touch screen that takes Leica TL (Leica T and Leica SL) lenses. APS-C format CMOS sensor new model introduced July 2017 that takes Leica TL (Leica T and Leica SL) lenses. APS-C format CMOS sensor camera system introduced Deccember 2017 that takes Leica TL (Leica T and Leica SL) lenses. 4/3 system lenses and R Bajonet via adapter. Limited edition with halfcase and cover and camera strap in grey leather. The new D-Lux 6 features a f/1.4 zoom lens as well as video. Also, the aperture can be adjusted on a aperture ting on the lens (instead of in the camera menu). Also available as Leica X a la carte editons where you can design your own colors. Limited edition designed by Paul Smith, in a collectors box with grey camera strap and matching grey half-case for the camera. Announced at Photokina 2014. Incl. Full Lightroom licence. Basically the Leica X2 continued under a different name. With internal 110MB memory. Announced at Photokina 2014 and comes with a redesigned, more lightstrong lens than the previous Leica X2. Also known as "Hemingway", the new digital full-frame mirrorless rangefinder camera. Delivery started on on June 11, 2015. If you are looking for the Leica Compendium (2012 print edition and 2014 digital edition) by Erwin Puts, please wisit his website for more info, or try search eBay for his books (usually sold out from the publisher rather fast, so they become collectors items). Stands for "aspheric design". Most lenses have a spherical design - that is, the radius of curvature is constant. These are easy to manufacture by grinding while "spinning" the glass. This design however restricts the number of optical corrections that can be made to the design to render the most realistic image possible. ASPH lenses, however, involve usually 1 element that does *not* have a constant radius of curvature. 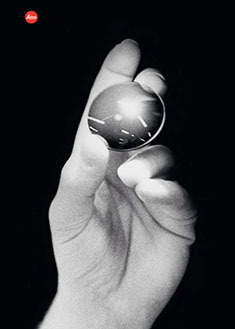 These elements can be made by 1) expensive manual grinding, 2) molded plastic, 3) Leica's patented "press" process, where the element is pressed into an aspherical ("non-spherical") shape. This design allows the manufacturer to introduce corrections into compact lens designs that weren't possible before. Practically, the lens performs "better" (up to interpretation) due to increased correction of the image, in a package not significantly bigger than the spherical version. A designation engraved (or silk printed) on top of Leica cameras produced for internal factory use only. 25-50 Leica MP Betriebsk cameras was produced in 1957. But for the M7 for example, ca. 100 M7 Betriebsk cameras was produced, intended for Leica dealers to have as demonstration cameras. Elmax = E. Leitz + Max Berak. Ernst Leitz was the founder of Ernst Leitz Optical Industry which later became Leica. Professor Dr. Max Berak was employed at Leica in 1912 and was the architech of the first Leica lens which Ernst Leitz asked him to design for the "Barnack's camera" (the 1913-prototype named after Oscar Barnack who invented it). The lens was a f/3.5 50mm and was known as the Leitz Anstigmat and later the Elmax. the ratio of the focal length of a camera lens to the diameter of the aperture being used for a particular shot. 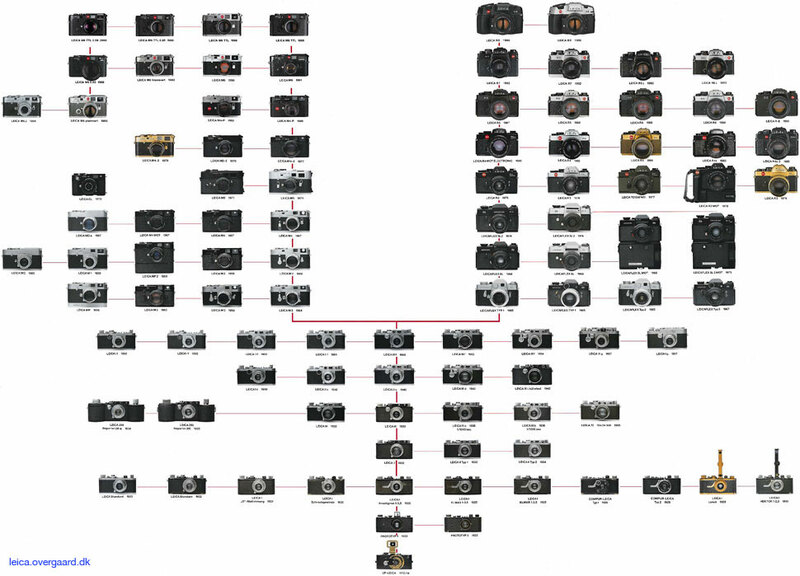 M3 - MP - M2 - M1 - MD - MDA - M4 - M5 - CL - MD-2 - M4-2 - M4-P - M6 - M6 TTL - M7 - MP - M8. Cameras that has been prepared to be fitted with a motor winder to forward the film. For example the Leicaflex SL for manual winding and the Leicaflex SL MOT that is likewise born with manual winding, but can be fitte with a motor winder. Stands (also) for Mechanical Perfection. A camera where the photographer is using a viewfinder to view and focus (measuring the distance) with; a camera where one is not looking through an actual lens when framing and focusing. viewfinder a device on a camera showing the field of view of the lens, used in framing and focusing the picture; often also works as an instrument to measure the distance (focusing).